From elegant Danish watchmakers Skagen, this sleek ladies' watch is crafted in fresh stainless steel. A matt case frames a brushed silver tone dial, simply detailed with glistening crystal hour markers. Finished with a slimline mesh bracelet, this timepiece offers the perfect balance of classic and contemporary styling. Elegant Danish watches inspired by the beauty of Skagen, Denmark. 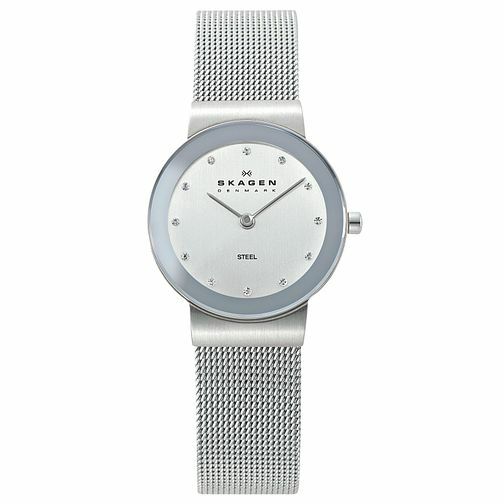 Skagen Freja Ladies' Stainless Steel Mesh Bracelet Watch is rated 5.0 out of 5 by 1.